This look is a definite contented for my V Festival outfits as its so easy to chuck on and go. I love the layering look here and it means that if it gets too cold I can chuck on the check shirt underneath as another bit of warmth. Or alternatively I can take off the jacket and the top half will still have interest due to the accessories. A body chain is essential to a good festival outfit as it just adds that little bit more; it also gives off the boho/festival vibes. This one is from Boohoo & I think wearing it gives the look more depth! 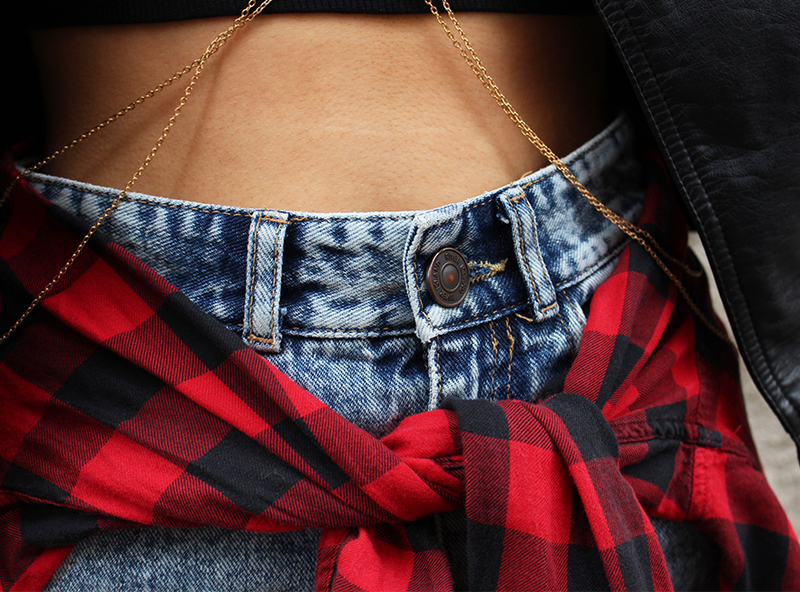 The check shirt tied around the waist is a classic festival / summer look and so simple to pull off. I also love the look of the shirt is in lighter tones of blue & green check as well. Exciting news that I mentioned in a recent post is that I am one of Motel Rocks' Festival Reporters! I'm going to V Fest in August and whilst I'm there I'm going to be taking pictures of everything going on & the experiences I have. I'll then do a write up for their blog which I'll show you. Finally, I'll also be wearing a whole Motel Rocks outfit at the festival so I'll be doing a blog post about that too! PHOTOGRAPHY: KATIE BRILL / STYLING: HOLLY ANASTASIA EDWARDSTOP: TIGERMIST via ASOS / SKIRT: MISSGUIDED via ASOS / SUNGLASSES: RIVER ISLAND / BAG: H&M (old) / HEELS: ASOSThis has got to be one of my favourite posts/outfits ever. I am in love with all white, as I said in my recent post, and the contrast with the outfit and setting is one I love too! We went to a new location we had never shot in before and it worked so perfectly, and managed to miss the rain too. Crotchet is one of my favourite trends at the moment and although I cannot wait to wear it in festival season, I think it looks so good dressed up as well. This top is from Tigermist and I think the structure and design is so beautiful; it cuts off at the right length and the design gives so much interest to the piece. Again with the colour blocking, I've chosen to mix the crotchet material with the crepe material in the skirt, to give more dimension and interest. I chose to incorporate black into the outfit to make more of an impact so I did this through the heels and bag. Now I've got to sort out some things, make lunch and then go off to work! It is such bliss not having to go to school anymore! I bought this dress in the Motel Sample Sale on the 29th of May. We were going to London to see Saint Raymond (a singer for those who don't know! ), so my friend Holly & I popped in to see what was there whilst the boys stayed in the pub. Hol found an amazing varsity top for only £3 & I picked up a bikini and a dress for £20! Amazing prices! This dress isn't something I would pick out normally as I'm not really a pattern kind of girl. I thought I'd mix it up and buy it as it would be a simple dress for a summer day. The bandeau top is a new shape for me as I don't have many clothes with this neckline but I think it is so simple and works really well. I tried it with & without a necklace and I think I'd wear it with accessories if I was going out, but for the day, I'd definitely keep it simple. Here I've just paired it with my AJ Morgan sunglasses in Tortoise Shell and my plain black boots from New Look. 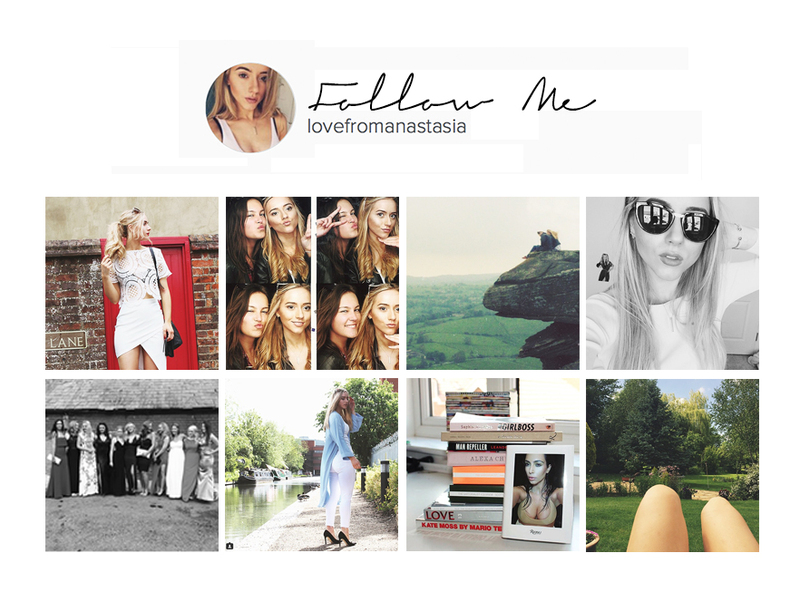 I am unbelievably excited to share the upcoming photos with you but if you want to see more from me, follow me on Instagram & Twitter or you can Like my new Facebook Page to get updates exclusively about Love From Anastasia! 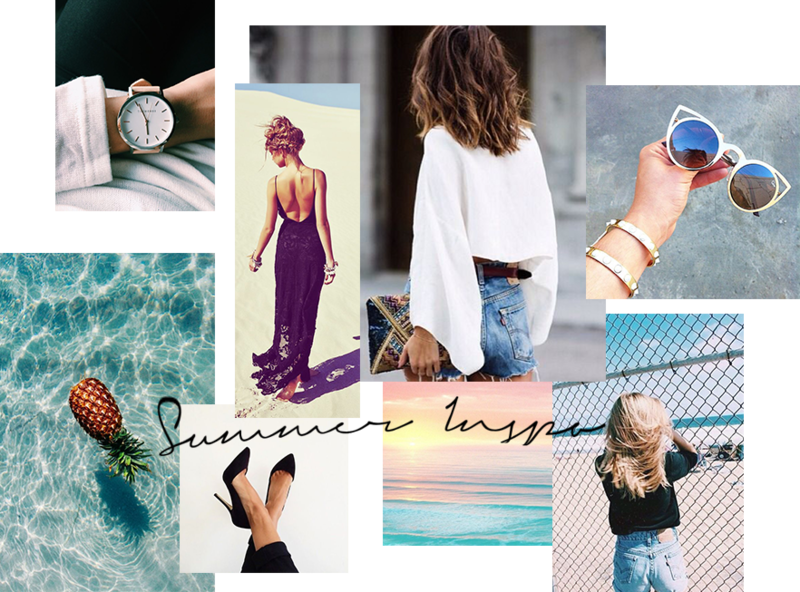 I've been obsessed with Pinterest at the moment & have found a bit of Summer inspiration. The weather is so gorgeous at the moment and it's so lovely just being able to wear light clothes and summer style! I'll probably post some more detailed inspiration for shoots & outfits but here's a little bit of inspiration for the moment. My favourite summer styles at the moment are crochet & off the shoulder. I love the effortless vibes that come from these pieces. This is a really casual look which I wear if I need to chuck something on and get out quickly. 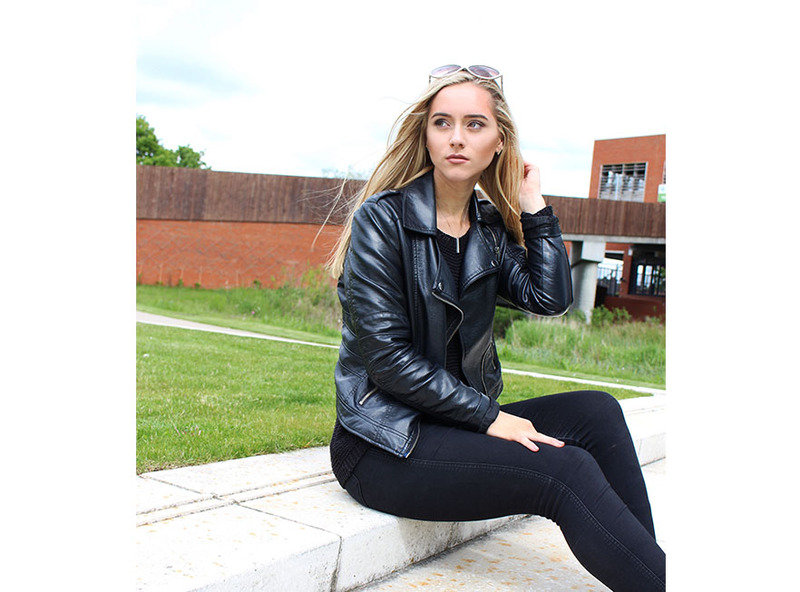 Black on black is the easiet look to achieve as there's no questioning if colours match. When I'm wearing all black, I try and mix the textures of the clothes to give more dimension to the outfit. Here I've worn a thick/loose knitted jumper, leather jacket & plain black jeans. The shoes I'm wearing in this are a little bit off as they are grey not black but obviously to create a completely all black look, you just have to swap these for black boots. You could dress this outfit up for a night quite easily by adding some simple court heels and a shirt - I'd probably go for a chiffon shirt just because it'll make the outfit a bit more interesting, again with all the textures. 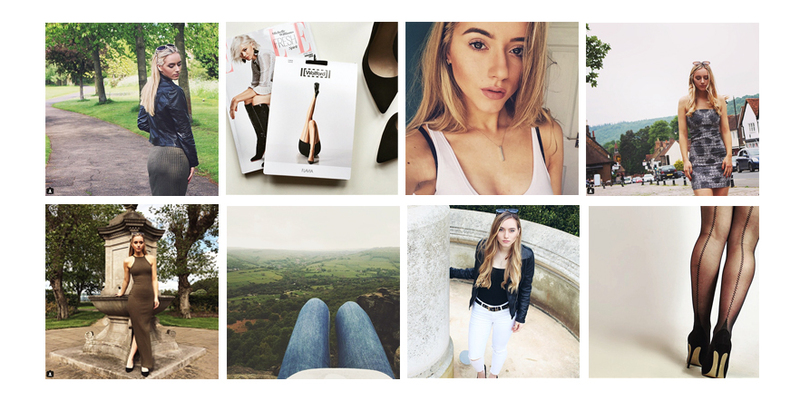 I hope you're all having a lovely week & are enjoying these posts now that I'm back!